The Hotel Hershey under the leadership of their Food and Beverage Director undertook an effort to measure and reduce the waste generated from their daily breakfast buffet. The following highlights the successes and challenges they had and some innovative ways they are dealing with their pre-service food waste. The Hotel Hershey team took tremendous strides during the pilot program and as a result of their participation in the program have become more food waste conscious. 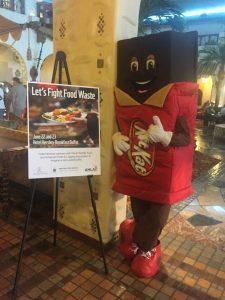 Distinctive to any other pilot program, The Hotel Hershey surveyed almost 100 guests on buffet offerings and opinions of food waste. Accessing guests’ opinions can be incredibly challenging, since a hotel is asking guests to take time away from their vacation to provide input on an issue that may seem irrelevant to their vacation experience. However, understanding guest behavior is critical to optimizing food production for reduced food waste and therefore guests’ insights are incredibly valuable to a property. The Hotel Hershey was able to successfully overcome this challenge by promoting the opportunity through posters at the buffet and casually engaging guests while they were waiting in line to request a table. The Hotel Hershey’s staff culture discourages waste and encourages staff proactively look for ways to be more efficient during service while still meeting guests’ needs. Food cost reports indicate that The Hotel Hershey is under budget for food to date by almost an entire point, compared to the previous year and to sister properties in the area who are currently over budget. This could be linked to the pilot, but further analysis needs to be conducted. "Understanding guest behavior is critical to optimizing food production for reduced food waste and therefore guests’ insights are incredibly valuable to a property. " It was difficult for The Hotel Hershey to balance luxury with efficiency when surveying customers on their buffet habits and opinions on food options. 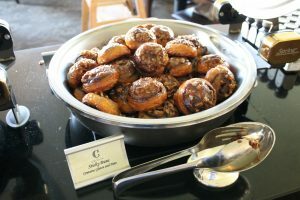 The breakfast buffet at The Hotel Hershey has a high price point, therefore it feels a bit intrusive to ask guests questions about their eating habits at buffets. How to approach this situation was difficult for the staff. The Hotel Hershey has a peak season in summer when younger, temporary staff come on board. During this time, it is difficult to work on behavior change due to the fast-paced work environment. Yet, when younger staff leave at the end of summer, it is also difficult to instill change with older, senior staff. Understanding the most effective times to show training videos and work with staff on food waste reduction goals will be an evolving facet of this work. Kitchen food scraps are recovered and delivered to ZooAmerica, a zoo only 1.5 miles down the road, to feed the animals. The Hotel Hershey also works with a local food bank when donating food still fit for human consumption, although very little food is recovered because most is used in the cafeteria. The Hotel Hershey is interested in expanding the food waste work to their banquets. They plan to present final project results to upper management with a possibility for project expansion to other properties and operations.